MIR is a class of Soviet wide angle lenses in the M42 mount. The Soviet production of M42 and M39 lenses was somewhat particular in the sense that the names of the lenses reflected a certain focal length. Therefore MIR lenses are synonymous with 20mm, 28mm, 35mm and 37mm in the M42 mount. Another specificity of the Soviet industry was that a lens could be manufactured in more than one factory. As such, you'll find the very same lens having different markings: KMZ, BelOMO, Arsenal and others. Also, some of these factories where specialized on certain models of lenses. Like other Soviet lenses, MIR lenses' roots can be found in the pre-WW2 Carl Zeiss Jena lenses. For example, the best known MIR, the 37mm f2.8, is actually a development of the Carl Zeiss Jena Flektogon 35mm f2.8. 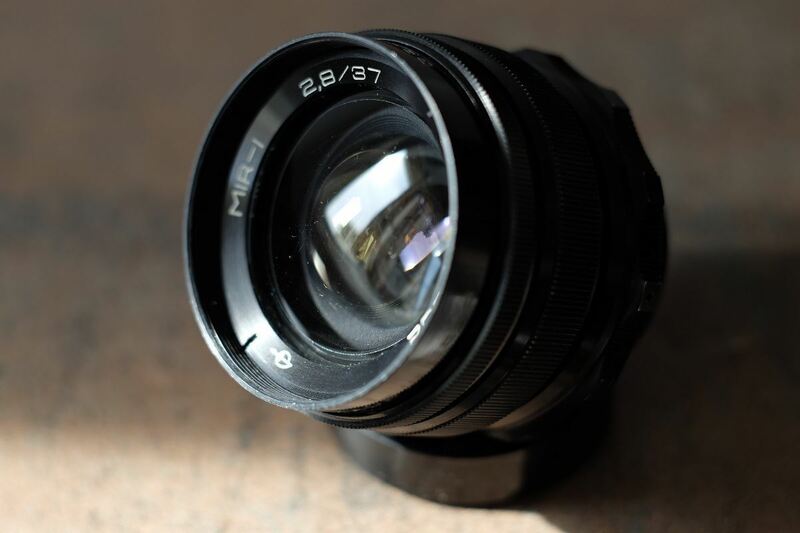 Another MIR lens, the 20mm f3.5 was inspired by the Carl Zeiss Jena Flektogon 20mm f4. The first version in M42 is made of chrome, which gives a very sleek look to it. During the 1970s at least, the 37mm MIR was still only single coated. Apparently it was only later that the Soviets introduced the multi-coating. For example, the multi-coated Japanese lenses were introduced in the first half of the 1970s. There are 5 types of MIR lenses: the 20mm f3.5 MIR 20M, the 20mm f2.5 MIR 47M, the 28mm f3.5 MIR 10A, the 35mm f2 MIR 24M and finally the 37mm f2.8 MIR 1. These were the only MIR lenses in the M42 mount to be mass produced. There were also other focal lengths, but these were used on medium format cameras like the Kiev. The quality of MIR lenses may vary depending on the period in which they were built. Construction wise, the 37mm lens initially had an all chrome design, which was later changed into "normal" metal, which in the end, was abandoned in favor finished of plastic. Moreover, despite having very good optical qualities, the Soviet lenses don't enjoy the same reputation as the German or the Japanese ones in terms of prestige. It's relatively well known that during the 1990s the manufacturing standards were very different from the 1970s, which were also very different from the 1950s.... Despite the lack in construction materials, the glass was fairly better treated than in the 1960s. Today the Mir lenses are hard to find and rather expensive. The Soviet made MIR-1 37mm f2.8 was inspired by the Carl Zeiss Jena's Flektogon. One of the earliest designs of this lens won the Great Prize at the Brussels World Fair in 1958. As a reminder of this achievement, many MIR lenses were marked with this text even twenty years later. This lens was still in production in the late 1980s. Initially, the lens was made of bright chrome and used the M39 mount before turning to the M42 mount. That was characteristic for many other Soviet made lenses, for example the Jupiter-9. Our version is made of metal and has the preset aperture, which was also a characteristic of the Soviet lenses. There is a newer version of the lens which is built using plastic instead of the good old metal. It seems that the black metal and the plastic versions were produced in parallel for a while during the 1980s. However, the most commonly found version is the metal one. The lens has nice colors and bokeh, but it lacks the sharpness of the CZJ Flektogon. The MIR-1 has a somewhat peculiar design: the focusing ring is placed near the camera mount and because of that it has been frequently confounded with the aperture ring. The lens is single-coated. The 37mm f2.8 MIR-1 has a minimum focusing distance of 0,7m, which isn't much for a wide angle lens. The 35mm f2.8 CZJ Flektogon has 0,18m... The MIR-1 weighs around 180g and uses a 49mm filter.